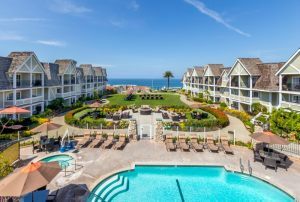 A California Timeshare Resort Near San Diego! 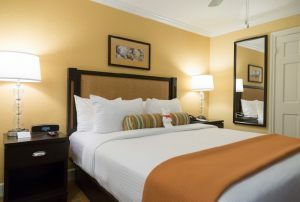 Just 61 accommodations make the Carlsbad Inn Beach Resort an intimate haven of privacy and relaxation. Enjoy the pool and hot tub or work out in the fitness center. Stay in touch with complimentary WiFi, settle back and enjoy a TV show, and chill snacks and beverages in your own refrigerator. Some accommodations feature full kitchens, fireplaces and all the comforts of home. Quaint architecture invites you to relax by the Pacific in this comfortable, smoke-free resort. In addition to many on-site activities, guests can head offsite to spend a day at LEGOLAND California, just 10 minutes away; or sunbathe at Carlsbad State Beach. You might wish to head out for a day in one of the nation’s favorite cities—beautiful San Diego right down the coast. Treat your family to attractions like SeaWorld San Diego, or the internationally famous San Diego Zoo and Wild Animal Park. Experience the warmth and beauty of a Carlsbad sunset from your home-away-from-home, the Carlsbad Inn Beach Resort. 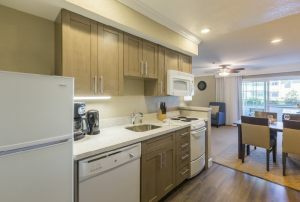 Just steps from the majestic Pacific Ocean, the award-winning Carlsbad Inn Beach Resort sits in the heart of picturesque Carlsbad, California. Stroll through the lush, green courtyard to the steps leading down to the rolling surf, or visit the area's countless boutiques and cafés in the heart of charming Carlsbad, including Norte's Méxican restaurant. Sorry but the report 'GPX-Carlsbad-Inn-Carlsbad' is empty. It does not have any listing data to display.